Transparency Market Research has identified five players that currently lead the global video surveillance and VSaaS market: Hikvision Digital Technology Co., Ltd., Bosch Security Systems, Inc., Honeywell Security Group, Axis Communications AB, and Cisco Systems Inc. However, competition in the market is intensifying with the emergence of players such as Agent Video Intelligence, Geovision, Inc., Genetec, Inc., Panasonic System Networks Co. Ltd., and Pelco, Inc.
Strategic alliance for new product development and quality product offerings is the most common strategy adopted by leading players in the video surveillance and VSaaS industry. Moreover, key players are introducing innovative video surveillance products to maintain their position. Companies are investing heavily in R&D activities for innovative product development and expanding their product portfolio. For instance, in 2015, Hikvision Digital Technology Co. Ltd. was reported to have invested US$190 bn in R&D activities while Dahua Security raised approximately 10% of its revenue in R&D. 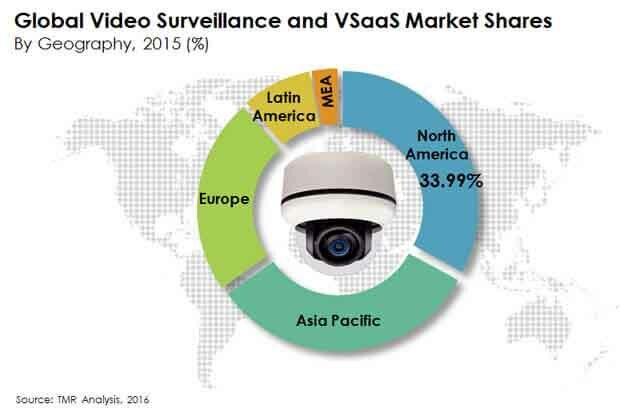 The global market for video surveillance and VSaaS was valued at US$21.19 bn in 2015. Rising at a robust CAGR of 17.0% during the forecast period 2016–2024, it is estimated to reach a valuation of US$88.25 bn by 2024. The global market for video surveillance and VSaaS is categorized on the basis of type, components, end-use industry, and geography. By type, the market is segmented into IP-based video surveillance systems and analog systems. In 2015, IP-based video surveillance systems accounted for US$11.60 bn and their demand is estimated to expand at a CAGR of 21.4% during the forecast period 2016–2024. The report observes that analog surveillance systems are being gradually replaced by IP-based systems; however, the demand for analog systems continues to grow, albeit at a sluggish pace. By components, the market is segmented into hardware, software, and VSaaS. According to the report, the VSaaS segment will expand at a significant CAGR of 25.4% during the forecast period, reaching a valuation of US$2.32 bn by 2024. The sub-segment of camera is projected to be most in demand in the near future, surging ahead of other sub-segments such as recorders and storage, encoders, and monitors. By end-use industry, transportation is expected to continue as the leading segment over residential, retail, business organizations, government buildings, industries, and others. Geographically, North America contributed to the most prominent demand in the global market for video surveillance and VSaaS market and the pattern is expected to continue. However, Asia Pacific is projected for the healthiest CAGR during the forecast period 2026–2024. The increasing number of terrorist attacks and overall security concerns on a global level are the primary drivers of the market for video surveillance and VSaaS. Some of the other factors studied in the report are continued investments in infrastructure, advancements in high definition (HD) and megapixel cameras, the advent of do-it-yourself (DIY), the need for centralized data and application management, and increasing IT costs. Additionally, several governments in emerging economies such as India and China are investing heavily in building smart cities. This factor is expected to boost the demand in the near future. Conversely, factors such as lack of privacy, high cost of IP video surveillance systems, bandwidth requirements, and low adoption by SOHO and small retailers are expected to negatively impact the growth of the global market for video surveillance and VSaaS.